Such a fun, delicious drink that will be memorable, and perfect for those summer catch ups with friends. 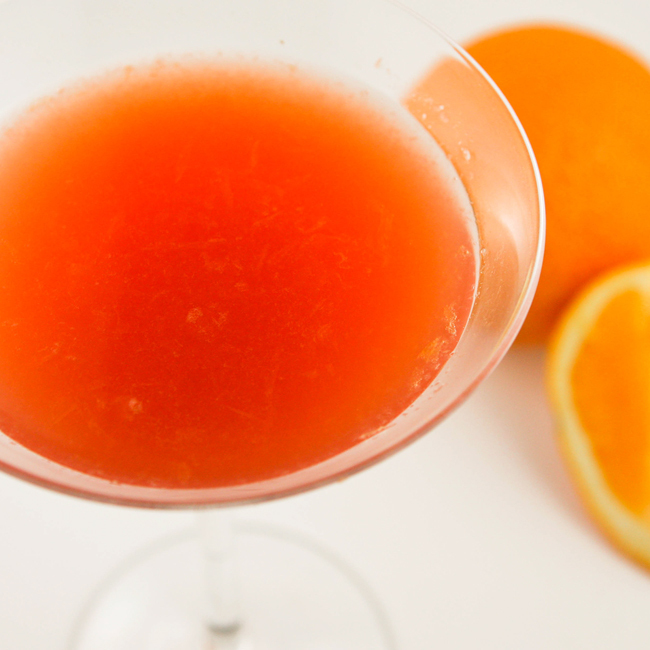 This Orange-Pomegranate Martini is wonderful because it’s made of fresh ingredients. This is a drink that has refreshing taste! I just got back from spending a few days in Denver with a friend. We spent our time walking around downtown, enjoying art and the mountains and eating A TON of delicious food. The food became the unintentional highlight and general theme of our trip. We did not have even one meal that we thought to be mediocre. I wish I had taken even one food picture, but I am sad to say that I did not. I was far too busy stuffing my face. Our hotel hosted free wine and beer for one hour every evening, so we didn't branch out much with the drinks. We did have one memorable non-wine drink, however. We had some time to kill before dinner on our first night in town, so we stopped at a swanky lil' bar and had a delicious cocktail that coincidentally tasted a lot like the martini featured in this blog post. The expensive version was not as tasty, though, because my version involves very freshly squeezed juice. Have I told you yet that my husband is a bit of a juicing fanatic? He goes through phases where he will literally run everything he sees through our juicer. I'm always happy to enter our kitchen to be greeted by endless glasses of various fresh juices. Put the lid on the shaker and shake gently. Strain the contents into 2 martini glasses. Top each with a splash of lemon-lime soda, and garnish with orange slices, if desired. Fresh squeezed juice takes this drink to the next level! Put the following ingredients into a cocktail shaker: orange juice, lime juice, pomegranate liqueur, vodka and a handful of ice. Put the lid on the shaker and shake gently. Strain the contents into 2 martini glasses. Top each with a splash of lemon-lime soda and garnish with orange slices, if desired.